This weekend, he suddenly kicked into cooking mode and had a cooking spree. Perhaps it was cooking withdrawal, but when we went grocery shopping Sat night, he had all these ideas for what to buy. He said something about a roasted red pepper sauce and fish, but then I saw Dungeness Crab for $6.99 per pound. We got two, each one weighing about 2.5 pounds and they were lively critters. 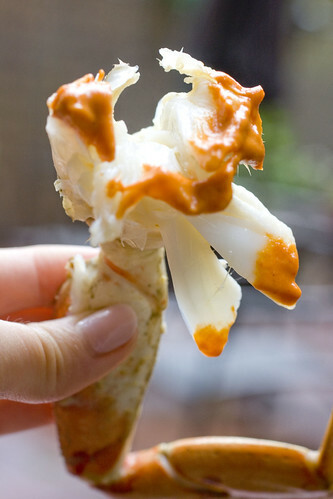 The plan was quickly adapted for crab and the rest is delicious history. 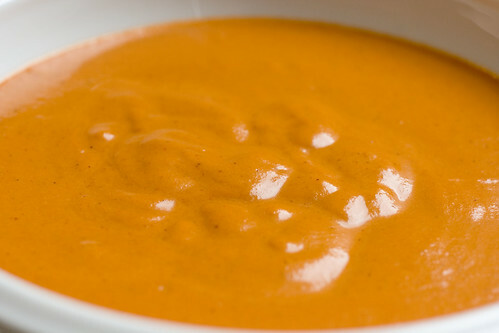 This easy blender-made Roasted Red Pepper Sauce is super versatile. We ate left-overs with some fried calamari. We spread some on crusty Italian bread. I think it would be great in sandwiches too. So don’t worry if you don’t like crab or crab is not in season. Place red peppers, garlic, vinegar, ancho chili, salt, cayenne, mustard, vanilla extract, and black pepper in a blender. Turn on the blender and run for 2 seconds before pouring olive oil in. While the blender is going, pour olive oil in a slow steady stream. Just blend until smooth. *You can make the red pepper sauce in advance and just store in an airtight container in the refrigerator. Bring it back to room temperature before serving. 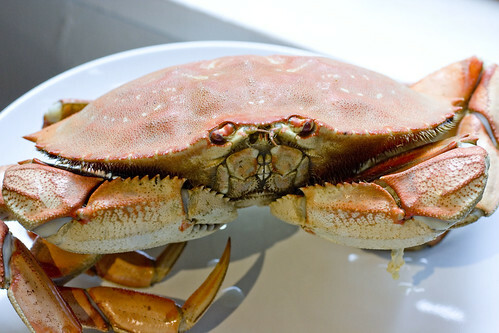 If you do want to serve with the Dungeness Crab (which is a heavenly match), we enjoy it steamed. A good guideline is to steam it for 7 to 8 minutes per pound (about 18 to 20 minutes for the 2.5 lb crabs). posted by jessica	at 09:47 AM	Filed under American, Recipes. You can follow any responses to this entry through the RSS 2.0 feed. Both comments and pings are currently closed. I remember growing up when my mom would go to the Chinese grocery store and buy a big box of crabs. She’d put them in the kitchen sink until they were ready to be cooked. They would be trying to crawl over each other and escape. Yikes! I was afraid of them. But Yum! They sure tasted good. 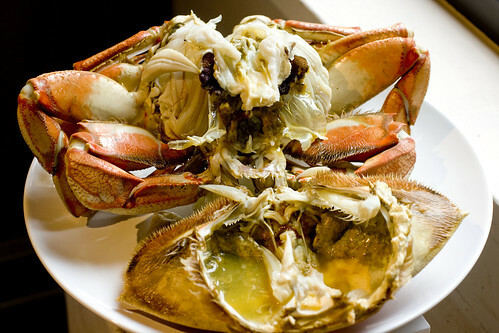 this is one of the best was to enjoy dungeness crab–pure and simply steamed! We like to throw some ginger in the water just for some of that essence. Anyhow, even at 6.99 that’s a great bargain compared with going out and getting the same dish. But in Seattle were I used to live, during season, it was around $2.50!! Asianmommy, my mom did the same thing and always tried to keep me from touching them. She’d warn me that I would get pinched but I still wanted to touch them. Grace, that picture does make him look scarier. Ravenouscouple, wow $2.50! I’ve never seen it at that price. I think it will always be more expensive on the East Coast though. At $6.99, we paid about $35 for two big crabs, and I remember paying $34 for one (much smaller) in San Francisco. I’ve had a dish of crab rested on cooked sticky rice in a Chinese restaurant. The juice and the flavor of the crustancean drips into the rice, which makes it extra yummy. Yup–$2.50 alright! I drive to Seattle every couple of weeks (only about 4 hours from here and it’s a *gorgeous* drive), and I love picking up fresh crab from Pike Place Market. A few weeks ago I brought back some awesome tuna. You two really should make an eating trip to Seattle. It’s right up your alley! Is that his little face peering up? Eek! Kim, I know exactly the dish you are talking about it and love it. They usually have an option for sticky rice or on rice noodles. Both are so good. You know, it’s really more just that Seattle is almost always overcast. The average yearly rainfall is 36.2 in. in Seattle, while it’s 39 in. in Chicago and 40.3 in NYC. And that was your daily nerd dose. Come to Seattle!! Portland is another great place for foodies–lots of attention paid towards fresh ingredients. OMG, that sauce sounds unbelievable! And you’re right, I can picture it slathered on almost anything. I am definitely trying that sometime soon. EMC, I’m shocked! I always thought it was constant rain there. Also, my cousin was just telling me that his friend moved to Oregan and is loving it. I need to check this all out! Allison, don’t forget to send me a picture! Poor Lon! I’m sure he’s also looking forward to a break and returning to the kitchen to unleash pent up creativity! Where did you get the crabs for such a price? This is one item I’ve struggled to find here for an affordable price. It’s true you can find large live dungenous crabs for $2.50/lb on the west coast. Although, I do like that we have great access to fresh lobsters here. I know how you feel, Baz is gone by 6.30am, back at 6-7pm, we both adore seafood & he introduced me to crab many years ago, I was a bit hesitant but I love it now! your photo’s are excellant Jessica! Christine, I got them at Hong Kong Supermarket in Elmhurst. I always look forward to Dungeness crab season. Whenever I answer the question, “What would be your last meal?” Dungeness is always part of the repast. Dungeness crab is so good! I wish I could get it in my supermarket! Sounds wonderful with the red pepper sauce!